Installs easily, without tools and takes less than a minute or two to install. The edging tool does the job but it really does not provide a clean sharp and requires a couple of passes to get the desired look. Still a lot easier than doing this by hand. Love this edger kit. It works great and is better than other edgers I have used. Thank you. Works great! Good quality. Easy to install. Received product just as ordered. Works ok, but it's not as effective as other attachments for the Honda. Makes the job easier but still requires manual edging to neaten up the results. 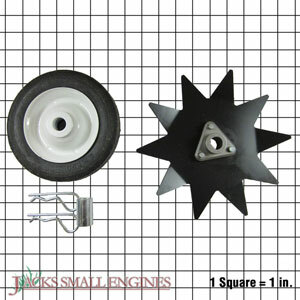 Ask us about the Honda 06728V25000 Edger Kit. Please no repair questions. Your Q&A may be posted to Jackssmallengines.com to help other shoppers, like you, with their purchasing decisions. Thank you.